The other day I posted some tips related to frequent flyer miles, and I mentioned the service Award Wallet. There are two versions of the program: free and paid. I’ve been using the free version and it’s been very useful for me. I can keep track of frequent flyer miles in 8 programs (although they have many more programs you can add to your “wallet”), as well as in some hotel and other rewards programs (even Best Buy Rewards Zone, for example). The service is great because it tells you in a very clear format how many miles and points you have in different programs, and it even tells you if they’re going to expire soon. To get the paid version, you can pay what you want (at least that’s how it was about a year ago; they may have set a specific price by now), and although the paid version is nice with more stats, the free version is also very useful. If you want to sign up, you can click on this referral link. It seems that if you do that, you’ll get the upgraded version for free for 6 months, and eventually I think I may get an upgraded version as well for referring people. If you don’t see that you’ve gotten the upgraded version, send me a note and I can give you a code that should work to do that. Still, no pressure; like I said, the free version is fine for me, and it’s definitely a convenient way to keep your miles and points tallies together. 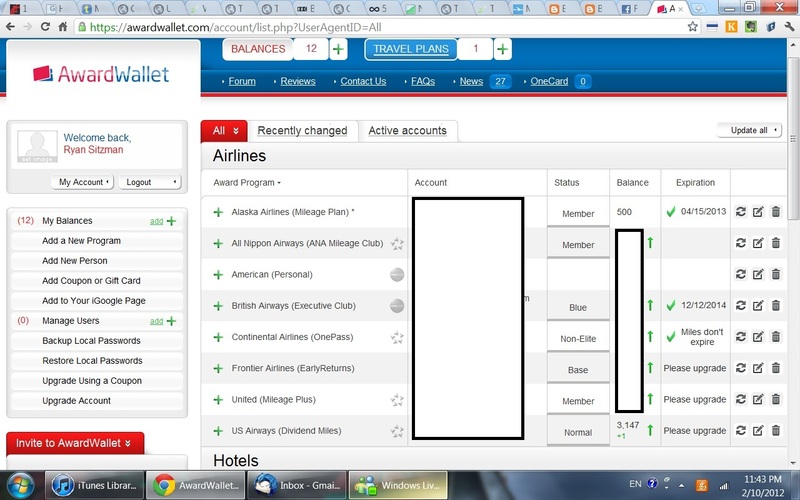 In a little bit I’ll put up the post about using credit cards to maximize your miles and points. Thanks for reading! This entry was posted in Award, Flyer, Frequent, Miles, Points, Wallet by Sitzman. Bookmark the permalink.